A stunning lower ‘Penthouse Apartment’ with secure underground parking. This two bed-roomed / two bath-roomed Penthouse Suite has everything you have come to expect from ‘The Mirador’ spectacular decor, cool furnishings, clean lines and attention to detail. Inside is drenched in unparalleled living accommodation, giving you a sense of extraordinary freedom and leaving you feeling that you have stayed somewhere special. 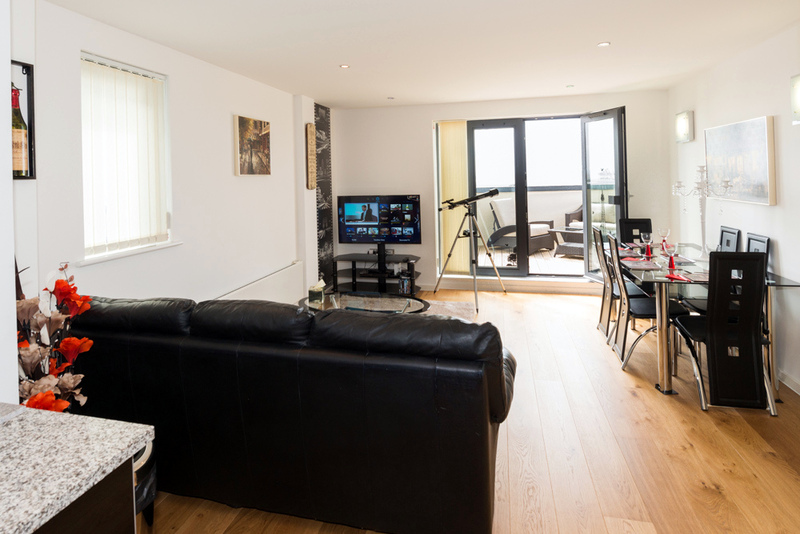 Outside there is over 90 feet of walk round terrace and decking overlooking Swansea’s Maritime Marina, Swansea Bay and its Sweeping Beaches. In addition and just to spoil you all a little you will discover a two-seater rattan sofa, coffee table and two individual rattan recliners. There are two double bedrooms. The master bedroom is en-suite with a superb purpose built ‘Power Shower’. It has simply the most dramatic bespoke antique white (KING SIZE) French Rococo bed with no less than an extra deep 3000 individual pocket sprung semi-orthopaedic mattress topped with a generous layer of memory foam guaranteeing you the most glorious night’s sleep; all wrapped up in bedding fit for a King & Queen. 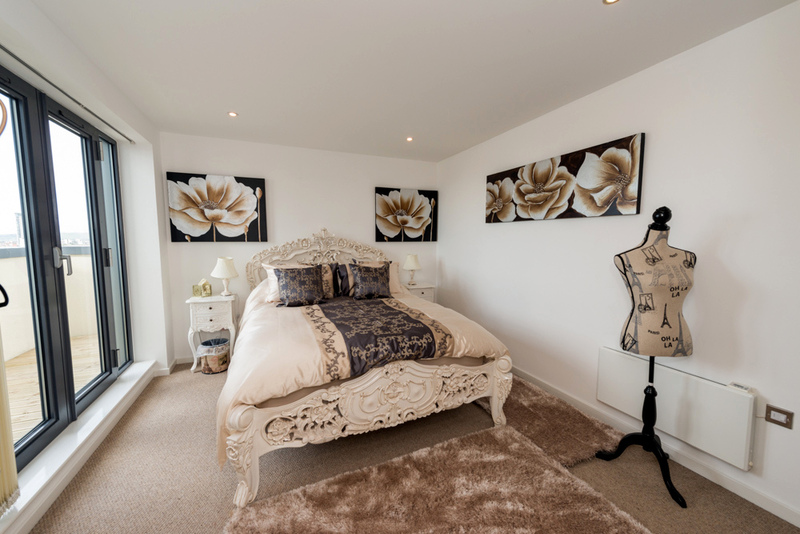 The second bedroom has an equally superb cream with gold fittings French Metal bed with exactly the same luxurious bedding. 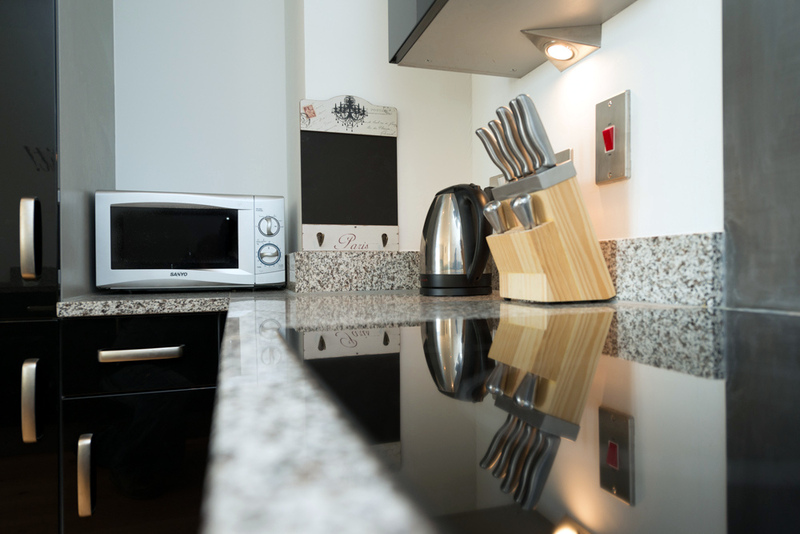 There is a fully fitted modern kitchen with a full sized fridge/freezer, electric oven & hob, microwave, kettle and toaster for those home cooked evening meals and early breakfasts. For those of you who don’t want to bother cooking but would prefer to eat out and remain feeling pampered, again you are spoilt for choice when it comes to local restaurants. First up and overlooking the harbour features the ‘The Americano Jazz Cafe’ an all round fantastic experience featuring ‘Live Jazz’. Round the corner is ‘La Parrilla’ a beautiful Spanish restaurant & Grill. Next door is ‘Two Cann’ a cafe by day and exquisite restaurant by night. Ice & fire another Mediterranean experience just across the street and next door is the ‘Thai Elephant’ restaurant. All within two or three minutes walk. Not forgetting SA1 all day breakfast cafe right opposite ‘La Parrilla’ and if that’s not enough, you’re only a hop skip and a jump from Swansea city centre. Your lounge area comes with the softest three-seater real leather sofa that fronts a 46 inch 3D Smart internet wireless TV with Sky TV broadband and Filmflex. Here you can literally access all your favourite TV shows, soaps, news, events, sport and films all at the touch a button and with four pairs of 3D glasses, no-one need miss out on anything. 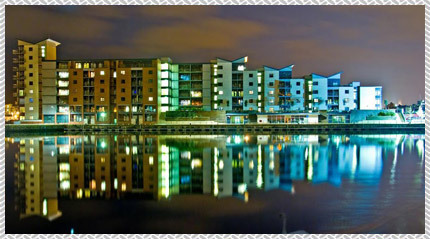 Swansea Hotels and The Mirador Group provides all guests with unique, highly recommended and stylish accommodation for all those wishing to visit Swansea and its surrounding areas. All our bedrooms which have been exclusively styled, are top rated by Booking.com The Mirador Hotel Group is therefore proud to offer you a stay that comes highly recommended by our guests...!